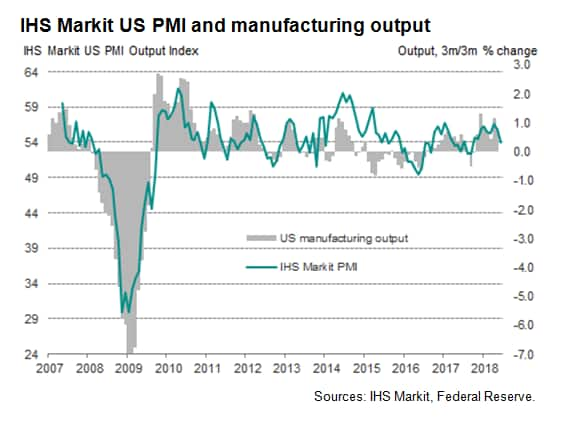 An overall solid performance of the US economy in June masks a slowdown trend in manufacturing, with PMI survey respondents reporting weaker output and order book growth alongside rising prices and increasingly widespread supply delays. IHS Markit’s PMI surveys indicated another month of robust growth for the US economy at the end of the second quarter. The June composite PMI, which covers both manufacturing and services, recorded 56.0 according to the early flash estimate, down from 56.6 in May but still sufficiently strong to indicate that the economy picked up momentum in the second quarter. Service sector growth looked especially healthy, the index dipping only marginally to indicate a monthly expansion almost as strong as May’s three-year high. Both inflows of new business and future expectations – key indicators of service sector activity in coming months – dipped slightly but remained above averages seen over the past year and a half. Manufacturing fared less well, however, with output growth slipping to the lowest since last September, fueled by a similar marked waning of order book growth. The relative buoyancy of the service sector numbers reflected robust demand in the home market, and the same could be said of manufacturing. The survey’s export orders index fell into decline for the first time since July 2017, registering the steepest (albeit still modest) fall in export sales since April 2016. 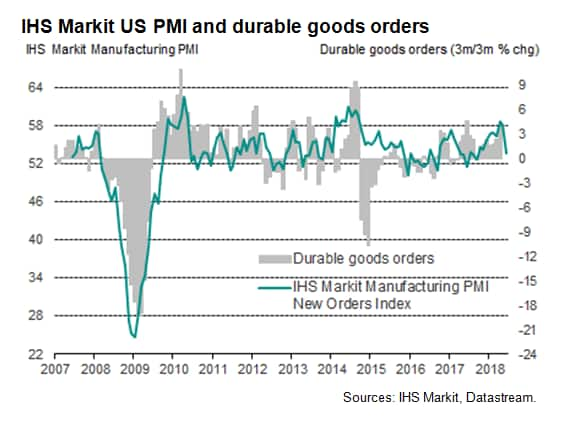 In the ten year history of the IHS Markit manufacturing PMI, the survey data have developed a high degree of accuracy in anticipating official data such as manufacturing production, factory orders, durable goods orders, prices and employment (see our separate note on the survey’s employment index here). In terms of manufacturing output, the survey data exhibit an 89% correlation with the three-month growth rate in the official number produced by the Federal Reserve. The latest PMI data are indicative of the three-month manufacturing output growth rate sliding to just 0.1% in June, based on an OLS regression. A similar analysis shows the PMI new orders index exhibits a 76% correlation with durable goods orders, and likewise suggest that the official data on factory orders has deteriorated markedly in recent months. The survey responses picked up very few explicit references to trade wars and tariffs in companies’ explanations of changes in order books, but the price questions showed more companies reporting higher costs linked to tariffs, notably for steel and aluminium. 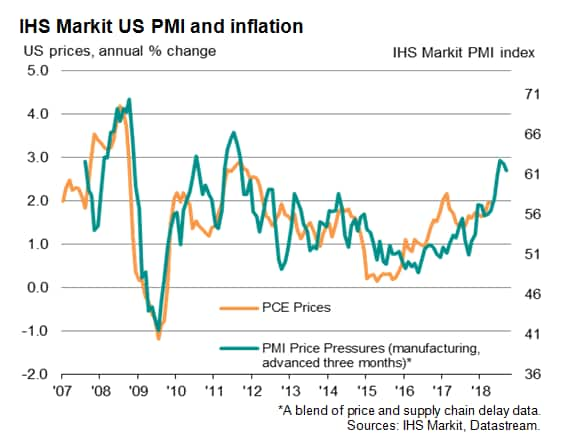 The manufacturing input price index slipped to a four-month low but remained elevated by historical standards, as did the output price index. Meanwhile, suppliers’ delivery times, a key indicator of future price hikes, signaled the highest incidence of supply chain delays on record, suggesting inflationary pressures have by no means peaked.